The Portuguese National Team completed their last test before kicking off in the 2014 FIFA World Cup and they've finally shown their true attacking strengths... Cristiano Ronaldo returned to the team and played the first 65 minutes, but the goals in this 5-1 win ended up coming from his teammates Hugo Almeida, Fábio Coentrão and Vieirinha. 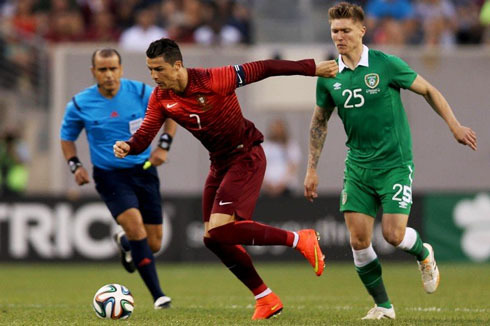 There were a lot of expectations in tonight's friendly between Portugal and Ireland, since not only it was Paulo Bento's last opportunity to test what his weapons can do ahead of the upcoming World Cup, but it also marked Cristiano Ronaldo's return to the team. The Real Madrid forward helped his side earning an easy 5-1 win against the Republic of Ireland in New Jersey (United States) and got to play for roughly 65 minutes in last night's friendly. The result was built on two goals from Hugo Almeida, an own goal from Keogh, a right-foot strike from Fábio Coentrão and also Vieirinha's first goal at the international level. The Portuguese Team will now fly over to Campinas to set camp in the Royal Plazza resort and on June 16, we'll have a Germany vs Portugal titanic debut for Ronaldo and his teammates to be welcomed in the competition. Six days away from the first match in the World Cup against Germany, Portugal's manager Paulo Bento, looked at this friendly against Ireland as his last chance to test a few last things before business really get serious in Brazil. Rui Patrício returned to the goal, but he wasn't the only change being brought in the defensive sector. Ricardo Costa and Neto paired up in the centre for the first time (the starters against Germany should be Bruno Alves and Pepe), while on the right it was Rúben Amorim who took João Pereira's usual spot. On the left, Fábio Coentrão proved to be in great form and excelled in almost every parameter. The Portuguese midfield was probably the strongest one that this squad can present, with William Carvalho playing in front of the defense and then the returning Raúl Meireles partnering up with João Moutinho to organize and set the tempo on the "Selecção" passing game. Upfront, the also-returning Cristiano Ronaldo had the company of Silvestre Varela and Hugo Almeida. It obviously wasn't the best game ever from CR7, but his presence on the pitch seems to have lifted up the moral for his teammates and the overall performance was quite satisfactory. The 2-0 didn't took too long to arrive either and this time the whole play was fabricated on the opposite side, where Cristiano Ronaldo teamed up with Fábio Coentrão when he brilliantly assisted him with a backheel touch that allowed the Real Madrid left-back to exploit the wing with some space. He then looked at Hugo Almeida in the box and tried to deliver him his second goal, but the cross got deflected on Richard Keogh's left foot and ended up tricking Ireland's goalkeeper, as the ball went over his head and entered at the far post. Bad luck for the Republic of Ireland, who were now 2 goals down and still before the first half an hour. Portugal wasn't thinking about hitting the brakes just yet though and they've gotten to their third goal in the 37th minute of the first half. Once again, it would all start on a great pass from Varela close to the right side-line. The 29-year old winger sent in a long cross into the far post and Cristiano Ronaldo met it by responding with a powerful header. 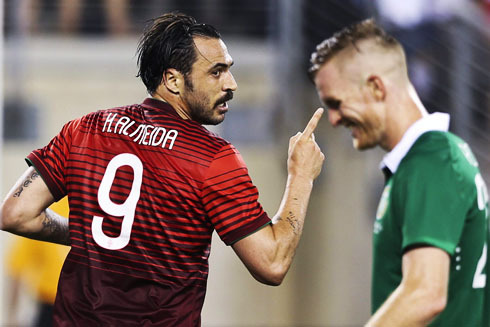 His goalscoring attempt was blocked on a first instance by Ireland's goalkeeper, but the ball went bouncing in front of him and Hugo Almeida was faster to react and scored his second of the night. 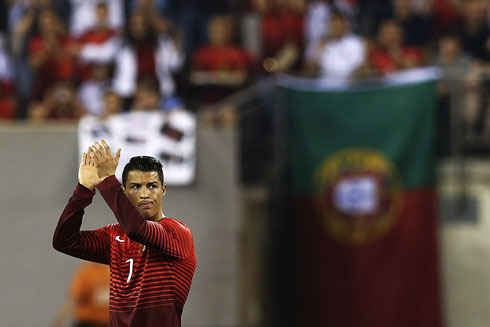 3-0 for Portugal and Ronaldo didn't even need to contribute with any goal until that point in the game. That was the result with which we went into half-time (3-0) and with such an uneven first half as we had seen at the Met Life stadium in New Jersey, Ireland knew that their pride as was at stake in the remaining 45 minutes. It was probably with that in mind that they managed to reduce Portugal's lead to 3-1 in the 52nd minute, in a play that exposed the "Selecção" to a serious lack of concentration following a free-kick a few meters outside their own box. Paulo Bento's men forgot to mark James Mclean on the right, and the Irish winger made them pay after cutting inside and finishing it off with a low but strong left-foot strike. As we got close to the 20th minute of the second half, Paulo Bento started doing a few changes on his side and one of them was taking off Cristiano Ronaldo to send in to the pitch Manchester United's winger, Nani. The Portuguese superstar was given the exact amount of playing minutes that his coaching staff had planned and there was no need to force it any further with the clash against Germany coming up right next Monday. After 5 changes done in its starting line-up, Portugal reached the 4-1 in the 77th minute, following a good cross from Nani on the left and a completely free from marking finish by Vieirinha. The VfL Wolfsburg winger saw his first shot being blocked, but the rebound fell right in front of him, allowing him to score on his second chance. That was also Vieirinha's first goal ever for the Portuguese National Team. The final 5-1 result was set four minutes later, in the 81st minute of the game. Nani added a second assist to his count when he sent in a perfect weighed pass along the left wing to Fábio Coentrão, and the Real Madrid player showed off his impressive stamina and finishing skills when he beat Ireland's goalkeeper with a right-foot shot by using the tip of his toes. It's now time for everyone to set their focus on the Germany vs Portugal clash that is coming up in just a few days and judging from what we've seen tonight, we can expect that at least both Cristiano Ronaldo and Raúl Meireles end up starting the game against the "Mannschaft". Pepe will probably remain a doubt until the game day, even though he was also given a few playing minutes this Tuesday night. Attackers: Cristiano Ronaldo, Varela, Hugo Almeida. Cristiano Ronaldo's next game will be his debut in the World Cup, on a match between Portugal and Germany that is scheduled for June 16 of 2014, in Salvador (Brazil). You can watch Juventus live stream, Germany vs Portugal live, Spain vs Netherlands online, Brazil vs Croatia live stream, and Chile vs Australia, all matches provided from our World Cup football streaming section.